The latest update on developments concerning the Leonid MAC airborne campaigns. Three snapshots of a bright Leonid meteor. High speed imaging has now for the first time shown details in the head of a meteor that reveil the dimensions and shape of the sources of light that make a shooting star. In a series of unique images obtained by Leonid MAC participant Prof. Hans Stenbaek-Nielsen of the University of Alaska, a meteor is seen to develop from a ball of light into a an object with a bow shock and a tail. These results were unveiled in a standing-room only special session "The 2001/2002 Leonid meteor storms" at the Fall Meeting of the American Geophysical Union in San Francisco on December 11, 2001. Left: detail of the meteor at frame number 400. Prof. Nielsen used an unusual intensified high frame-rate camera, specially designed for sprite observations. This camera records video images at a rate of 1000 frames per second. Nielsen, a Danish national, observed from a site at Pokers Flat, Alaska, and had to continually watch a video screen to catch the meteor in flight. The images shown above are frames #200, 300 and 400 from a 463 millisecond sequence of a bright Leonid meteor at 10:48:59 UT, November 18. These are false-color images. The originals are in black-and-white only. The red color is chosen arbitrarily to highlight contrast. The frames are cropped in horizontal direction. The vertical field of view is about 6 degrees. The meteor starts as a very localized ball. Then it brightens and develops a tail, and one can clearly see the shock set up around the front. "Our images for the first time confirm that most meteor light comes from a bright plasma just behind the meteoroid," says Leonid MAC PI Dr. Peter Jenniskens of the SETI Institute at NASA Ames Research Center. This confirms conclusions made indirectly from spectroscopic studies in prior Leonid MAC missions. "The images now provide dimensions of the gas cloud behind the meteoroid", says Jenniskens, "and tell us how long organic molecules have to endure a hot plasma before cooling down". Just behind the gas cloud, a wake develops that is thought to be due to green forbidden line emission of OI at 557.2 nm. Jenniskens believes that the bow shock may be a consequence of the vapor cloud of ablated material surrounding the meteoroid growing to sizes larger than the mean-free path in air at altitude. "This emission may be responsible for some of the ionised emissions of Mg+ and Ca+ that are observed in bright Leonids", he says, "more so when the meteoroids are larger". The pictures for the first time show the meteor's bow shock. The special Leonid storm session was organised by Jenniskens in collaboration with Prof. Chet Gardner of the University of Illinois. 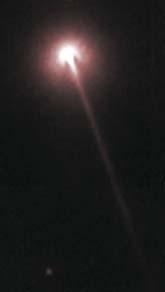 Presentations included this and other first results of the 2001 Leonid campaign, new modeling of meteor physical processes, studies of the erosion of organic matter in meteoric plasma, the expected mass distribution of Leonid meteoroid fragments, and the announcement that tiny 1 nm sized dust grains of recondensed vapor may now have been detected in the upper atmosphere.